Arthur A. Levine Books, 9780545451680, 32pp. Tabby McTat loves his life on the streets with his owner, Fred, singing (and caterwauling) for coins that people throw in Fred's hat. But one day, Fred is in an accident, and the two are separated! Will Tabby and Fred find their way back to each other? 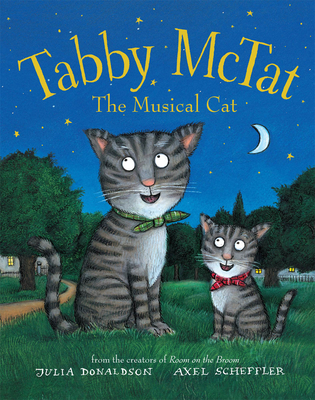 From the creators of A Gold Star for Zog and Stick Man, Tabby McTat is a touching story of friendship, loyalty, singing - and kittens! Julia Donaldson served as the UK Children's Laureate from 2011 to 2013 and has written many bestselling and beloved picture books and novels for young readers. She lives in Glasgow, Scotland, with her husband, Malcolm. Axel Scheffler's award-winning books include Room on the Broom, The Snail and the Whale, and The Gruffalo. His illustrations have been published in more than thirty countries. He lives in London, England.